One of the more enjoyable parts of designing a real time strategy game is creating the units. There is a sense of freedom and enjoyment to it but this part of RTS design can also lead to critical errors that are hard to fix once the game hits beta or even live. While it may be hard to really clarify what is a well or poorly designed unit, or entire faction of units, today I want to talk a bit about the process of what we see the most successful games do and what games that struggled did wrong. First we will delve into the visual design of units and how it can impact new players. Right off the bat I want to talk about unit clarity. This one I think all designers of any game will agree on, you want your units to clearly stand out from their counterparts and you want them to convey their role in some manner. This is easier for games set in the real world, Company of Heroes does this exceptionally well because you can see what the unit is holding. Even if most units look similar in uniform what is in their hands quickly allow you to judge what they are. This is even easier for armored vehicles since their shape and the size of their cannon gives you an idea of what they can do. Can a tank’s turret rotate? Easy to tell due to being grounded in the real world. The same generally holds true for games set in the past like the Age of Empires series. The harder scenario is when you are designing for a game that is set in the future. Callum McCole over at Stardock discusses this a bit in a wonderful video where he shows how alien technology can convey traditional tropes of unit design while also making it unique and foreign in Stardock’s Ashes of the Singularity. But the main goal with this is to create units with a name or silhouette that hearkens back to something the player already knows. Few games do this better than the Starcraft series. They have two very alien races but their units are very clear in what they are. Even unit quotes can convey a unit’s design. Take the Protoss Immortal, from its name you can make a guess of what role it plays and quickly know what it does. Or the Zerg Roach (hard to kill) or Swarm Host (it hosts a swarm, get it). Even the Terran race could have suffered from the issue of units looking too similar but the design the infantry have clear silhouettes. The Marine has a clearly smaller size than the Marauder which are both very different than the Reaper and Ghost. Few games screw this part up but, and I’m going to refer to this game often, Act of Aggression struggles here. While there is so much to like about the game we are going to be using it as an example of how not to do unit design. If you take a look at a number of their units you can tell them apart, what role they play or if they are even different from other units in their control group. Visual clarity is so vital for both experienced players (micro) and new players (learning unit roles). In a genre that generally requires focused attention with little time to stare at a unit to see what it is, making players waste time to know what unit composition they are fighting is bad design. This is the case in AoA, so often I had to zoom in just to see what units where on my screen. In a game with exceptional graphics, this is just a waste and something that shouldn’t be the case. If you are watching a battle then unit clarity should be easy and quick and aid you in your decision making. Brown Bear has an wonderful video on the topic that is worth a watch if you have a few minutes. When it comes to creating a role for their unit for the most part game designers do this well but on occasion there are units that aren’t clear in what purpose they serve, even if the game as a whole does a good job. Tooth and Tail has incredible unit design and on almost every unit there is perfect clarity on what the unit is and what it does with almost zero overlap but The Distillery Brothers and Lizards for new players tend to be very confusing in the role each play. A well designed strategy game will show player that each unit has a role through how it interacts with other units as well as its visual design, which we already discussed a bit. The role of a unit is what it does well and what it does not do well. That isn’t to say all units need to be niche, that isn’t the case at all, some of the most iconic and balanced units in real time strategy games are well rounded units, but the role that unit holds still needs to be clear. Does it deal area of effect damage to weak units? Or is it a tankier unit to soak up damage for the other units? Maybe it is a siege unit or harassment unit? With this in mind units should have as little overlap as possible. When you have multiple units that accomplish the same goal, players can become confused as to which unit is the best solution to the situation they may be struggling with. Act of Aggression struggles with as well. 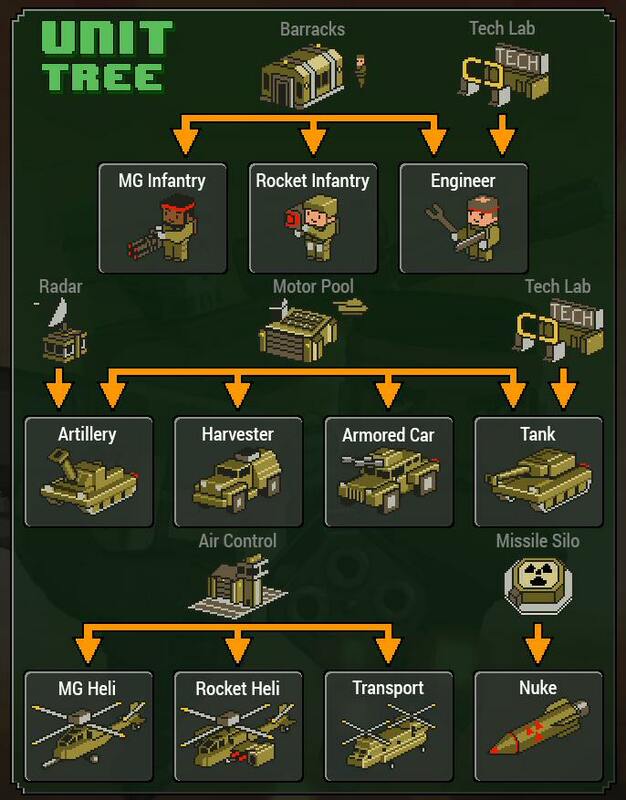 Along the tech tree in the game we find units that in their tool tips are said to accomplish the same goals, this isn’t good. This is both the failing of the tool tip (which is supposed to define units and educate the player) and units design because it fails to assist the players. When you have two or three units that all aim to fill the same role, why are they in the game? There are two good solutions I’ve found. The first is obvious, minimize overlap. This doesn’t mean you should not have any overlap, even the best games have multiple units filling a role but they should do so in different ways. In the last Starcraft 2 expansion, Legacy of the Void, a new unit was introduced to the Terran faction, the Liberator. This was a fascinating unit, in its standard form it was an air unit with splash anti-air damage but it could transform into a stationary ground zone control unit that would deal devastating single target damage. Many players were concerned that Terran did not need another anti-air unit as they had other strong options such as the Marine, Thor and Viking and the Liberator would be unnecessary. But what gave the Liberator a role rather than being pure overlap was the second form, ground zone control. While it could provide strong anti-air support we eventually saw it find a place in unit compositions because while on the surface it would overlap too much but because it was designed with depth, it had a role while also not pushing other units out. That is actually a good test of overlap, if you introduce a unit and another unit is no longer used by players then your new unit overlapped the old unit too closely. So removing units with too much overlap and when you do have overlap, make sure the unit still have a role. Even a simplistic design like found in the 8-Bit series does a fantastic job of this. The second option is to follow the Age of Empires method. While the game does feature overlap in a bad way it removes part of it by using ages, when you reach a new tier your units are replaced with a better version. If an Age of Empires game was built like Act of Aggression (sorry, I really do like AoA) then you wouldn’t replace the old units, you’d keep them as well as the new ones. This would lead to a cluttered UI, a frustrating experience for players old and new and creates a situation where redundancy because the entire game. If your game doesn’t have tool tips that tell you what the unit’s role is then you need to add them right away. Even if units look similar, having a tool tip that explains their function does helps everyone and is generally a quick addition. Just do it. As I mentioned above about Act of Aggression’s units being redundant, that really isn’t the whole case. While the units do often have near perfect overlap but once you get them in combat there are some difference in how they behave. But because their tool tip in the production building uses the exact same language, for a player who has never used these units in combat they would never know that. I have never designed a unit myself so I asked my co-writer Wayward to add his thoughts on the topic. As someone who has worked on a number of games and designed his share of units, I asked for his feelings on this topic. Wayward here. I’ve found that there’s kind of an art to writing tooltips: if the text is too long, players will miss important information. Too brief, and it’s not useful. Thus far, I’ve had my best results with the following formula: First, summarize the unit’s role or function. It’s a combat harvester. It’s a light skirmisher. It’s a frontline damage-dealer. Keeping the description agnostic is important; delving into game jargon can add confusion and cognitive overhead. A tooltip is there to ease cognitive burden, to give a quick idea of how you can use this… tool. Secondly, say as briefly as you can what it does. It summons 2 units from corpses every 10 seconds. It shoots a jet of fire at all ground targets in a line. It slows its attack target. It’s especially important to highlight quirks and specific numbers where possible: 20 DPS with 20 damage dealt every second has a different use case than 20 DPS where the unit deals 200 damage every 10 seconds – you don’t want to use that second one against masses of light units, if it doesn’t deal area damage. With those 2 things out of the way, the player should be in a good position to experiment and succeed. Lastly, if absolutely necessary, tell what that unit shouldn’t do. It’s weak to anti-air. It’s useless if it runs out of Energy. These sorts of things can frustrate the player, especially if they’re unintuitive. Brevity and clarity are competing goals with tooltips, and it can take a little work to reach a sweet spot. It isn’t easy designing RTS units, it is actually possibly the hardest part of designing the game at all. But when you look at a unit it is a story of how the game was designed. A clear visual designed combined with a defined unit role shows a well thought out game. Truly books could be written on the topic with many more examples of good and bad designs but I felt the need to dip my toe in on the topic and share my thoughts. This is an important topic and one I just address two points of but a good thought exercise to end with is pick your favorite real time strategy or tactics game. Then try and add a unit to it that accomplishes both of these goals (clear design and has a role). If the game you choose has a hard time adding a new unit, the designers likely did a good job.